Well here we are still in Island Head Creek not that there is anything wrong with that under better condition it is a fabulous place to stay for an extended period of time with beautiful long golden beaches and glorious wilderness waterways to die for, but now I am getting that “I need to be moving” feeling. The strong northerlies dropped away during the night leaving calm, calm before the storm I feel. Morning brought the rain, rain by the buckets loads; speaking of which we still haven’t done anything about our rain catching apparatus and it will be raining all day again. With the rain came the wind, strong winds from the SW, 25-30knt winds and they are blowing all day as well. The change in wind direction and wind strength has pushed AR in closer to the southern sand shoal. Here we are again on a Lee Shore! The day goes by and from inside the saloon and cabins we keep watch and listen to the wind howling about; there is no rest for the wind or for the rain and the day drags on. 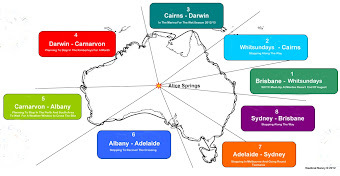 I pass my time reading through some of the information booklets that I have collected or MrJ has printed on the northern parts of Australia; making special places to be taken note of in future. We watch and we listen and now that the day is drawing to an end and the tide is flowing out we are now looking as well. Looking at the water receding revealing the sand shoal behind. I even take time to notice the numerous waterbirds along the appearing sand bank but am more concerned about the ever encroaching sand. Looks like there will not be much sleeping tonight!